I grew up in Pennsylvania, not too far away from New York City. As a child, I studied various instruments, music theory, and composition. I ended up going to school for classical music and tried my hand at all kinds of things in the music industry. For several years, I worked as a music engraver and copyist for classical concert hall composers and also as a music software developer making third-party plugins for Sibelius and ProTools. Eventually, I teamed up with a business partner, a brilliant composer in his own right, Jason Rothman, to start Mirrortone Studios. The studio led me back to making music composition my bread and butter—currently, about half of my work is writing music for film, series, and commercials, and half is producing and writing for recording artists. indieactivity: Write about your career briefly? 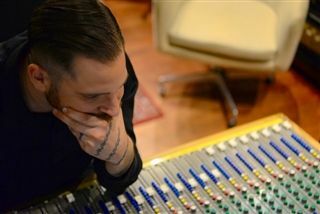 Roman: I am a composer and Billboard-charting music producer (known as Electropoint) who owns Mirrortone Studios in NYC. I have composed and produced music for advertising agencies and corporations, for television commercials, TV shows, short films, feature films, radio, and Internet campaigns. Brands that have used my music include DKNY, Clinique, Marriott, Michael Kors, Maserati, Tom Ford, and many more. TV networks I have composed for include E!TV, A&E, MTV, Oxygen, BET, Bravo, Netflix, Discovery, TLC, and NASCAR. In addition to corporate music composition, as a producer I have worked with indie labels and Grammy-winning artists alike. Aside from composing music for picture and artists, I also do a lot of audio post work like sound design, ADR, and mixing. indieactivity: Did you study music or film scoring? Roman: I was part of an accelerated music program at Hunter College through which I received my BA in Music Theory and my MA Music Composition in four years. indieactivity: Describe your process as a film composer? Roman: It always starts with the director’s vision. In many ways, my job is not to compose music but rather to be the instrument through which the director composes music—I aim to find, capture, polish, and sync the organized sounds we call music in ways that best heighten the strengths of each film as envisioned by its director. The degree to which I truly impart my own interpretation on scores varies from project to project; I enjoy working with different directors who have distinctive working styles and allow me to use different parts of my skill set. indieactivity: Who is your greatest inspiration? Roman: I have always loved Renaissance music deeply because of counterpoint, which is the interweaving of multiple melodies. Counterpoint is the musical texture that is the most three-dimensional and in that sense of dimension and image, it reminds me of film. I often need to abandon that strong sense of melodic loyalty when composing for a scene with dialogue but I find that those moments heighten, through contrast, the times when poignant melodies return. Monteverdi and Josquin des Prez always move me to the core. As far as formative film and television composers go, the list is pretty long. To name just a few, lately I’ve been inspired by composers such as Brian Tyler, Craig Armstrong, Henry Jackman, Patrick Doyle, Tyler Bates, Alexandre Desplat, Harry Gregson-Williams, John Powell, Howard Shore, Steven Price, Ennio Morricone, John Paesano, Jerry Goldsmith, Abel Korzeniowski, and Dave Porter. indieactivity: What books do you read? Do you talk at a seminars? Roman: I read a lot of manuals. 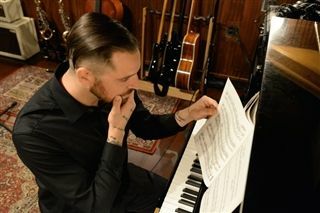 In all areas, not just in music, I’ve always felt that theory was the key to beauty that it’s impossible to capture something if you don’t understand how it works or how it’s built. Put another way, I’ve always found it difficult to think outside the box without knowing where the edges of the box are—so manuals of all sorts, whether they outline theory, technology, lifestyle improvements, language skills, or other bodies of knowledge, can get me thinking creatively more than can fiction. As for lecturing, I’ve spoken more as a music producer and theorist than strictly as a film composer. I’ve been invited to speak on panels as a music producer as well as at music theory conferences. indieactivity: When you get a project, what procedures do you implement? Roman: When I am working on a project that has come with a temporary score, the key is to understand what the director loves about the example music and then to tailor those elements to the imagery and timing. I feel fortunate to have worked with enough commercial clients that I feel comfortable taking this approach; in fact, I find it to be a very fruitful type of collaboration because it allows for creative expression but tempers the free-fall of compositional liberty by exacting the client’s expectations. In cases in which the director wants the composer’s complete interpretation of the piece without temporary music in place, perhaps if I am just going off of some reference tracks that aren’t dropped into the footage, I will spend a lot of time trying to learn the director’s artistic background and preferences so that I can align my creative instincts with their aesthetic. In all cases, the first step is always the same: get the picture lock, or as close to the lock as they have, and do a spotting session. Sometimes, if my clients are not based in New York, the spotting session might take the form of an email or a phone call but I aim to clarify instances in which music will be necessary. Once I know exactly what kind of music is needed and where in the film it is going to be, I start mapping it out in Pro Tools: getting all the bars setup and matching tempos to the cut. Since directors hire me to create the full score delivered as audio, I must actually compose and produce the music, not score on paper for an orchestra, so I will assemble the whole project in ProTools using the entire studio as my instrument. My usual scoring texture is an organic hybrid of acoustic instruments played live in the studio combined with electronic instruments. There really is no limit to what can be done with software these days but having a full studio at my disposal is irreplaceable—hanging up some microphones and bowing cymbals or getting personal with some real, tangible instruments imparts an immediacy and an intimacy that’s palpable. The key to providing the filmmaker with a custom composition in fully mixed and mastered audio format is to have done it in such a way that revisions are possible. This is where having done things in stages and saving every move along the way is of the utmost importance. The method of that is rather technical but it really just has to do with clear labelling of all tracks, printing as you go, and saving source material. After the score is completed, I usually send two assets to the director: a score-only audio file that syncs to the print of the film and a reference movie that has the score mixed into the film, in case they don’t have immediate access to their film editing software. From there, it is most often a matter of conversation and editing until it’s all ironed out. indieactivity: Tell us about near misses, your failures and successes? Roman: Success is a lot easier to talk about but of course failure is a big part of this profession. There is no composer or producer who hasn’t felt the sting of a lack of response to a submission, but that’s just a part of the acquisition and audition process—and an important one, too, that can lead to a lot of growth, especially early in one’s career. There are also learning moments in this industry that can be more jarring—in one instance, I was referred to a director for whom I composed without a set contract because everyone involved in the project trusted them. The director seemed like a promising client at first but fell out of touch after several drafts of the score, only to end up using unauthorized versions of my work as well as my name in a version of the film shown at a festival—all without making contact or offering payment. The hard lesson there was if you can’t get something in writing or get paid upfront, something might be awry. Especially considering how tough this industry can be, I’m really grateful for my successes. As a producer, I’m fortunate enough to get to make music for commercial recording artists and reality TV stars, and the first time a song I produced for a pop client like that ended up hitting the Billboard Charts was a great day in my musical life. I still get incredibly excited every time a big brand has me custom compose for a commercial—it has all the creative benefits of scoring a movie (albeit a really short one!) and you also know that many people will hear your work across several different media platforms. While I’m grateful for each of the commercials I get to score, two of my favourite commercial projects have been a Maserati commercial that has gotten millions of views on YouTube and a track that Clinique liked so much they bought the rights for perpetuity and have used it in several of their online marketing campaigns. It’s actually quite difficult to single out the film projects that I feel most honoured to have worked on. Every director and project is very close to my heart, so I almost feel that singling some out would do a disservice to those I wouldn’t mention. Of course the ones that have won the biggest awards or have the most famous casts are the most impressive to mention when promoting my work or meeting with a prospective client, but I’m truly thankful for each and every film, short or feature, that finds its way to me.